Jackie Dives, a past Got Craft vendor and the new organizer of Swap-O-Rama-Rama, will be kicking off her art show at Libby's Cafe on 18th and Victoria in Vancouver. 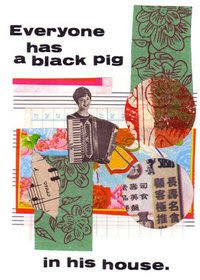 All new art work will be showcased including a series of collages using 22 Chinese proverbs. Go check it out! The show is only on until the end of the month. For more information, visit Jackie Dive's facebook event page here.